Daniel Burnham of Chicago’s D. H. Burnham & Co., an innovator in developing the skyscraper, designed the Neo-classical style Frick Building (1901-1902), as well as some twenty other buildings in Pittsburgh. Henry Clay Frick, the developer, bought the property next to the Carnegie Building so his 20-story granite structure would throw a shadow over Andrew Carnegie’s office tower. During your visit you can explore the lobby, complete with two sentinel lions, a stained glass entitled "Fortune and her Wheel," plus learn more about the building construction and interesting spaces of the Frick Building from the Docent who will be onsite. Opened in 1902, the Frick Building was built by and named after Henry Clay Frick, an industrialist, founder of the HC Frick & Company (coke manufacturing). This led him to a partnership with Andrew Carnegie, serving as Chairman of the Carnegie Steel Company (the predecessor to US Steel). The Frick Building was designed by Chicago architect, Daniel Burnham. The top floor includes a balcony around the perimeter of the building, a high, handcrafted ceiling, and heavy, elaborate brass door fixtures. 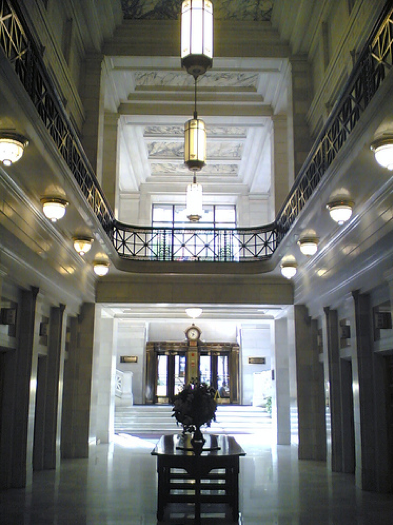 Originally, H.C. Frick used it as his personal office and as a meeting place and social club for wealthy industrialists. On the 19th floor was Frick’s personal shower. At the time, no other shower had been built that high above ground level. The shower, non-functioning, still exists on the 19th floor today. During your visit you can explore the lobby, complete with two sentinel lions, a stained glass entitled “Fortune and her Wheel,” plus learn and see more about the building construction and interesting spaces of the Frick Building.